The examination of the sulfate concentration in cement is vital, because the presence of high amounts of sulfate delays the hydration of the aluminate phase. Especially for blast furnace slag cement the total concentration of sulfur and the ratio of the two sulfur species finally determines the cement quality. Traditionally the sulfate concentration is analysed with wet chemical methods requiring long analysis time combined with high costs. In general, X-ray fluorescence (XRF) is used to determine the total concentration of the elements. However, today the analysis of the different chemical compounds of lighter elements such as sulfur is possible by using wavelength dispersive XRF (WDXRF) with modern high-resolution analyser crystals. The different chemical compositions of the sulfur species will cause a peak shift, which can be used to separate both sulfur compounds, sulfate (SO4 ) and sulfide (S2-) and determine the concentrations. The results can be used to calculate the slag concentration by subtracting the part derived from cement from the total sulfur concentration. This report explains how the modern sequential WDXRF spectrometer S8 TIGER performs speciation of sulfur in cement samples. The X-ray line shifts (chemical shift) Both the Ka and Kß lines show a shift of the line position. The physical reason is a shift of the energy levels caused by the chemical bonding influence. Additional X-ray lines appear (Satellite lines) There is a significant difference concerning the presence of an additional line on the low energy side of the Kß line of sulfate, but not for sulfide. Changes in the ratio between Ka and Kß The sulfide/sulfate ratio can be calculated based in the Ka/Kß ratio with respect to the total sulfur concentration. For the quantification of sulfide and sulfate the samples are analyzed with the sequential WDXRF spectrometer S8 TIGER. The S Kß line is measured by using the fine collimator with an opening of 0.23° and the high resolution crystal XS-Ge-C. This curved crystal provides a higher resolution and increased sensitivity for sulfur in comparison to traditional crystals, leading to a better analytical performance. The absolute precision of the goniometer positioning is vital for the accurate determination of the sulfur species. The S8 TIGER owns a high precision mechanical goniometer with ElectronicGearing for the optimised simultaneous rapid and reproducible positioning of all system components. This ensures the optimum resolution of neighboring peaks. In both spectra the effects of the chemical bonding on the spectrum can be seen. The S Kß line shows a clear peak shift of about 0.2° (2Θ). This difference is typically too small for a routine determination of the two compounds.The intensity of the S Kß line is composed by the emission of sulfide and sulfate. But sulfate in addition has a satellite line on the low energy side, the so called S Kß SX line. The difference of the peak positions is about 0.68° (2Θ), which can be clearly resolved. The total sulfide concentration can now be analyzed using the Kß line. The part from sulfate is subtracted by defining a line overlay correction based on the satellite line S Kß SX. The S8 TIGER was calibrated using a set of 8 cement samples with varying concentrations of sulfide and sulfate. In addition also the ratio between both compounds was not constant. The samples were freshly prepared as pressed powder. For this 10 g sample was milled with 3 tabs of cellulose grinding aid and then pressed with 20 t for 20 seconds in aluminum cups. Measurement time was 60 seconds for each line and 30 seconds for two common backgrounds. One additional cement sample was measured 10 times to check the stability and repeatability of the method. The analysis of sulfide and sulfate in cement samples for quality control can be realized on a daily routine based on WDXRF. 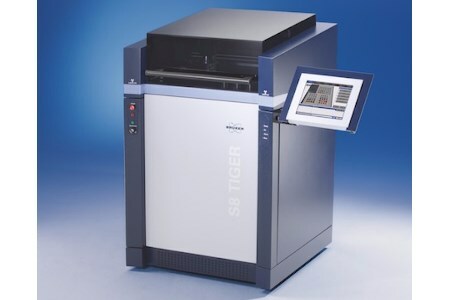 The S8 TIGER with the high resolution setup, applying the fine collimator and the curved crystal XS-Ge-C allows the accurate and reproducible analysis of neighboring peaks. The differences between the reference values and the measured concentrations are in the very low ppm range while the total concentrations of sulfur in the cement are in the range of 3 to 5%. This report demonstrates that WDXRF can completely replace time consuming wet chemical procedures in the cement laboratory. This report illustrates the growing trend in the cement industry where more and more applications are done utilising analytical instruments instead of wet chemistry. The perfect example of this trend is the automated analysis of raw materials, clinker and cement mineral phases using X-ray diffraction techniques. Bruker recently introduced a new updated version of its ENDEAVOR series – the D8 ENDEAVOR. With its ready push-button solutions, the D8 ENDEAVOR is easy to use and provides fully automated analysis without further user interaction. Together with the new 1D detector LYNXEYE XE-T, the D8 ENDEAVOR completely analyzes all cement constituents in less than 5 minutes per sample. The D8 ENDEAVOR, as well as the S8 TIGER X-ray spectrometer, can be easily integrated into any existing or future automation environments. World Cement is not responsible for the content of external internet sites.